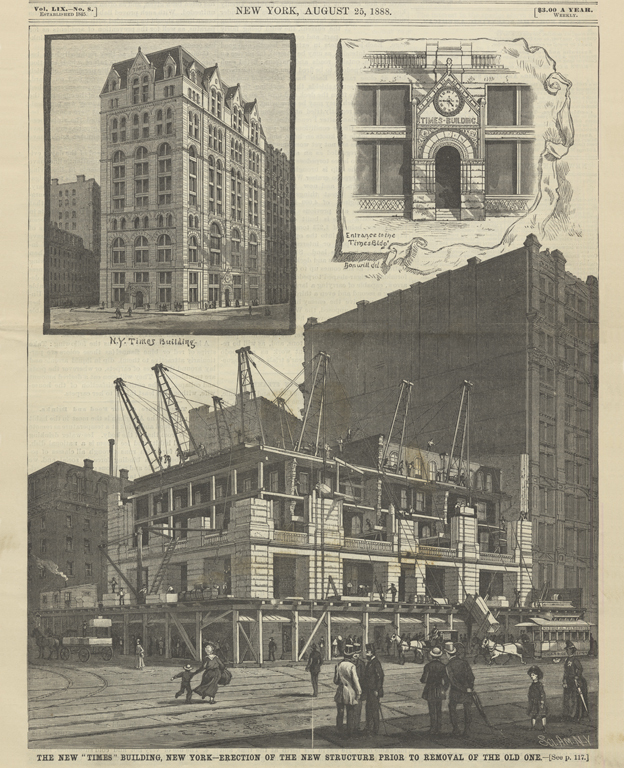 "The New 'Times' Building, New York-Erection of the New Structure Prior to the Removal of Old One." Scientific American, August 25, 1888, cover. The New York Times moved to Park Row in 1857 after outgrowing its rented quarters at Nassau and Beekman streets. 41 Park Row would be the third office location for the rapidly growing Times since its founding in 1851. The Times Building was designed by architect Thomas R. Jackson as two mirror-image five-story stone buildings facing onto Printing House Square and City Hall Park. Printing presses and other machinery occupied the basement levels and the paper's offices were located on the first, fourth, and fifth floors, leaving two floors available for rent. Tenants included the Surrogate Court Office and the Patent Office. By 1888, the high-rise development of Park Row and the demand for rentable space in the area prompted the Times to capitalize on its prime location with a building that would more than double their space and provide additional rental income. George B. Post, the country's pre-eminent architect-engineer, was hired to design and erect the new building on the same site without interrupting any of the paper's operations. As the cover of Scientific American here shows, the replacement literally went up around the old. Stone load-bearing walls were gradually replaced by a metal-cage construction favored by Post that embedded iron members within the granite walls. King's Handbook of 1893 declared the new Times Building: "discreet, moderate, bold, vigorous, perfect in every detail of ornamentation, in moldings, in capitals, in gargoyles, so beautiful that it charms the na�ve and the refined, the ignorant and the most learned, in art; the Times Building is the Times expressed in stone." After the paper relocated to Times Square in 1905, the former Times Building was renamed 41 Park Row and enlarged. Architect Robert Maynicke designed the alteration, which included the removal of the original mansard roof and the inclusion of two additional stories. Today, Pace University occupies the building.